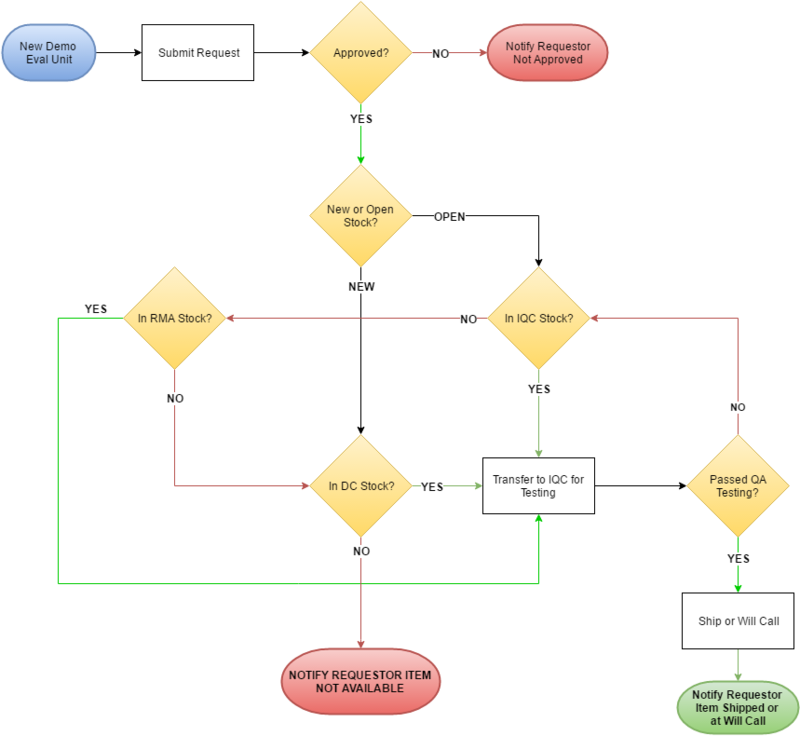 The flowchart below describes the process of requesting a demo / evaluation unit from company inventory. Sales representatives fill out a web form requesting a specific demo unit. The request goes through an approval step. If approved and available, then the unit is prepared for shipping / will call. The stock departments are DC (new inventory), RMA (open inventory) and IQC (items in the test department). QA is within IQC. It is preferred that demo units be pulled from from open (RMA or IQC) stock. If the request was approved to come from new stock (DC), that is OK. If a new item was requested, but it is not available, then the item will be pulled from open stock. All units go through the QA for testing. Only good units can be released for shipment or will call pick up.